ÄŒup M., NovotnÃ½ R., GurskÃ½ P.:Testovanie implementÃ¡ciÃ­ prenosovÃ½ch protokolov pre distribuovanÃ© systÃ©my. Poster on ITAT 2009. GurskÃ½ P., HorvÃ¡th T.,JirÃ¡sek J.,KrajÄ�i S.,NovotnÃ½ R.,PribolovÃ¡ J.,VanekovÃ¡ V.,VojtÃ¡Å¡ P.: User Preference Web Search -- Experiments with a system connecting web and user. Computing and Informatics Journal, Vol. 28, no. 4 (2009), p. 515-553. 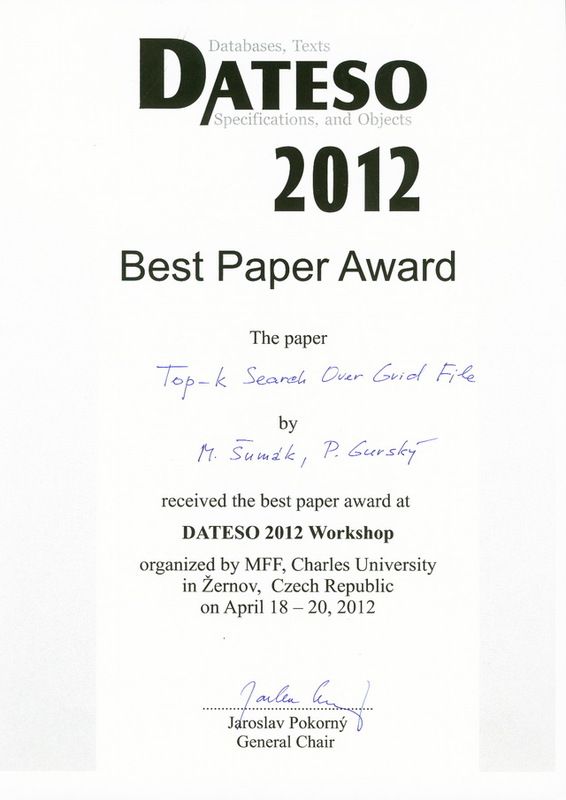 GurskÃ½ P., PÃ¡zman R., VojtÃ¡Å¡ P.: On supporting wide range of attribute types for top-k search. Computing and Informatics Journal, Vol. 28, no. 4 (2009), p. 483-513. GurskÃ½ P., HorvÃ¡th T.,JirÃ¡sek J.,NovotnÃ½ R.,PribolovÃ¡ J.,VanekovÃ¡ V.,VojtÃ¡Å¡ P.: Knowledge Processing for Web Search â€“ An Integrated Model and Experiments. Scalable Computing: Practice and Experience, ISSN 1895-1767, 9:51â€“59, 2008.